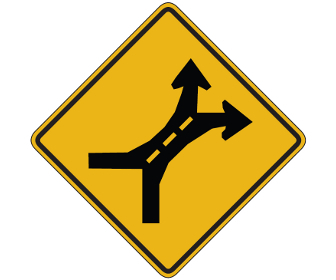 An intersection is a point where two or more roads join together. An intersection is an especially dangerous part of the road due to the fact that vehicle trajectories may intersect, which would automatically result in a crash. According to statistics, crashes at intersections, driveways and highway entrance ramps are the second most common type of traffic accidents, it comes right after hitting a stationary object. 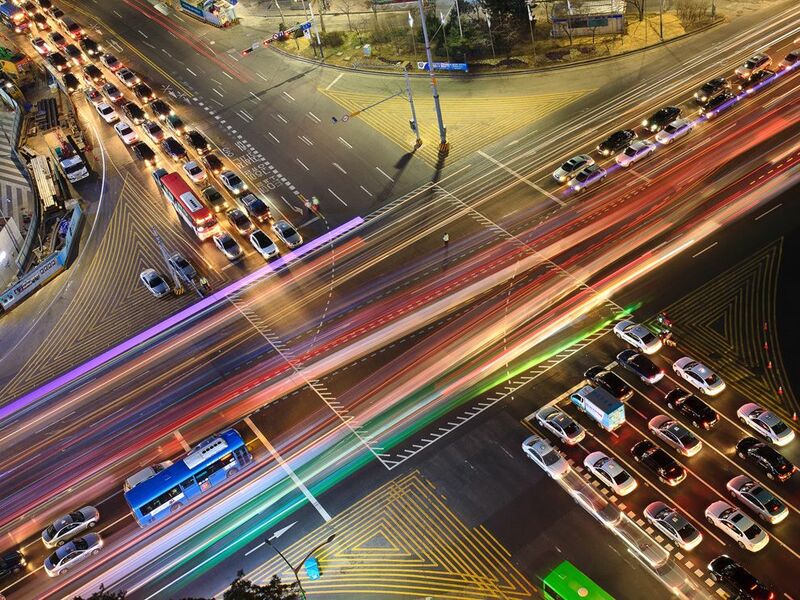 There are many different types of intersections, they are categorized by the number of roads joining at the intersection and their configuration. A regular 4-way intersection is probably the most common intersection out there, but you will also encounter more complex intersections, such as Y-intersections, roundabouts and interchanges. Access to the intersection may be controlled by traffic signals, road signs or the “right-of-way” rules. A controlled intersection utilizes road signs or traffic signals to control the flow of traffic through the intersection. 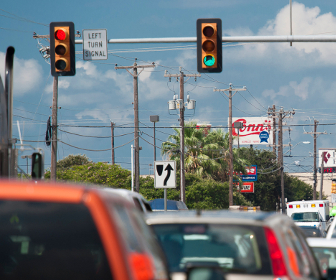 Knowing and observing these signs and signals is imperative to your safety. Traffic signals are one of the most recognizable parts of road infrastructure, we learn how to use them from a very early age. Traffic signals control movement of all traffic through the intersection: this includes vehicles, cyclists and pedestrians. Traffic signals can be arranged in vertical or horizontal lines. A yield-controlled intersection is another common type of a controlled intersection that uses yield signs to prioritize traffic moving from a certain direction. Vehicles entering the intersection from a road that has a yield sign installed must slow down and give way to all other traffic going through the intersection. 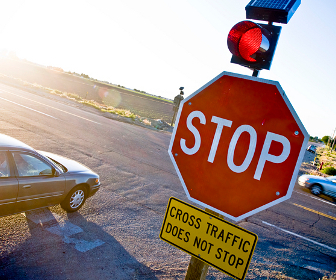 A stop-controlled intersection is another common type of a sign-controlled intersection. Vehicles entering the intersection from a road that has a stop sign installed must come to a complete stop and yield to cross traffic before going through the intersection. 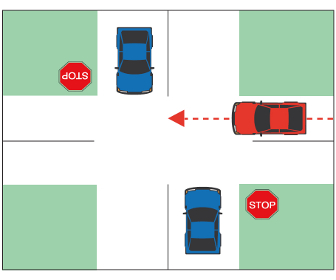 A four-way stop intersection requires vehicles coming from all directions to come to a complete stop before going through the intersections. Vehicles that arrive to the intersection first have the right of way. Uncontrolled intersections are usually employed in places where low amount of traffic does not warrant installation of additional traffic control devices or where such traffic control devices may not perform at their best and confuse drivers. 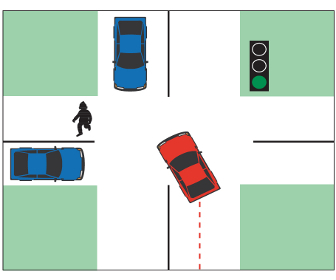 When going through an uncontrolled intersection, you must observe the right-of-way rules and pay due caution. 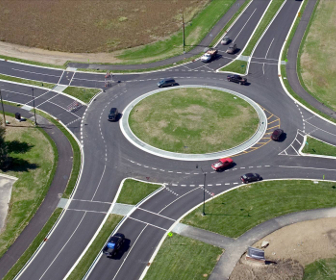 Two most-recognizable types of uncontrolled intersections are highway interchanges and roundabouts. An interchange is the intersection of two highways at different levels with connecting roads that transfer traffic from one highway to another. The main advantage of an interchange over a regular controlled intersection is that traffic can enter or leave either highway without stopping or interfering with other vehicles that are already traveling on the highway. This reduces traffic blocks and allows for more vehicles to pass through the intersection. 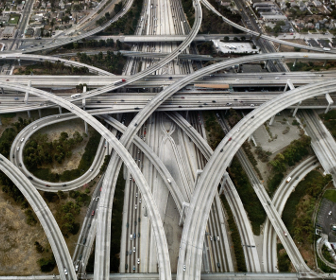 Although there are many different types of interchanges, the most common ones are called “directional”, “cloverleaf”, “diamond” and “trumpet”. A roundabout is another type of uncontrolled intersections where traffic circulates around an island in the middle of the intersection. Vehicles that are about the enter a roundabout must yield to traffic that is already on the roundabout. Always look out for and yield to pedestrians and cyclists that are crossing the road. 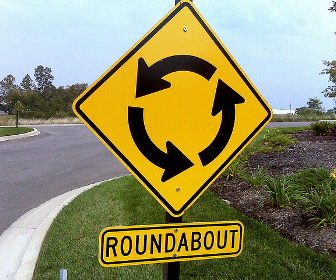 Note: some roundabouts are controlled by yield signs and additional pavement markings but it does not change the right-of-way rules. Traffic signs may be installed directly at the intersection or on approaches to the intersection. Warning signs are usually installed on approaches to intersection, while regulatory signs are installed directly at the intersection. Warning intersection signs, such as the “cross road”, “side road”, “T-intersection”, “Y-intersection” or “circular intersection” let you know when there is an intersection ahead and provide you with information on how the roads join each other. Regulatory signs, such as a “yield” sign, “stop sign”, various lane use control signs are installed directly before the intersection. 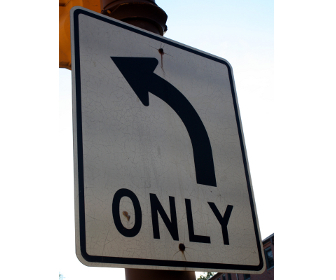 Regulatory signs advise you on the direction of traffic and turning restrictions. Lane use control signs are usually posted directly above traffic lanes. 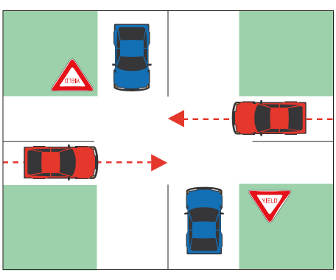 At uncontrolled intersections, the driver must yield to all vehicles that have already entered the intersection. 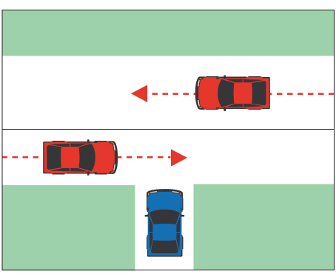 If two vehicles arrive at an intersection at the same time, the driver on the left must yield to the driver on the right. Unless you are making a protected left turn under a green arrow traffic signal, you must yield to oncoming traffic and pedestrians crossing the road. 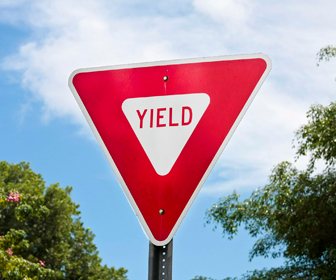 When there is a yield sign before the intersection, you must slow down and yield to all vehicles that are on the protected route. When there is a stop sign posted before the intersection, you must come to a complete stop and yield to all vehicles on the protected route. 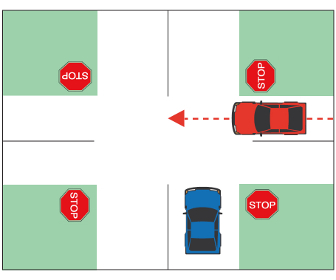 On a 4-way stop intersection, the vehicle that arrives to the intersection first has the right of way and enters the intersection first. 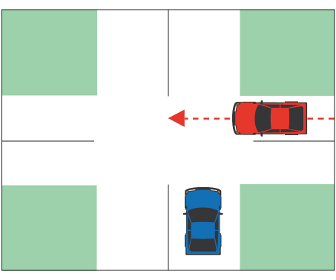 If two vehicles arrive at the intersection simultaneously, the driver on the left must yield to the driver on the right. When you are entering a street from an alley, driveway or when you are at a T-intersection, you must yield to all cross traffic and pedestrians crossing the road. 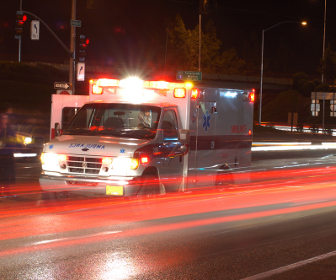 You must yield to all emergency vehicles (fire fighters, police vehicles, ambulances) when they are displaying a flashing red or blue light and sounding a siren. You must pull over to the side of the road and stop. Do not proceed through the intersection until the emergency vehicle has passed. If you already entered the intersection, clear it before coming to a stop. 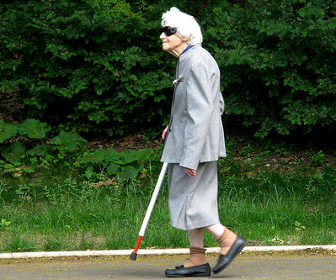 You must give way to blind pedestrians carrying a white cane. Slow down and be prepared to come a complete stop if you see a pedestrian carrying a while cane near the roadway. Parking within intersections is illegal. 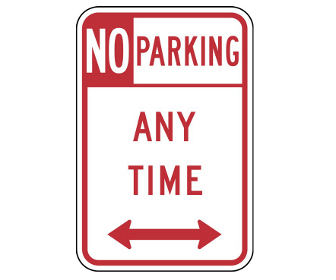 Most states require that you do not park within 20 feet of a crosswalk at an uncontrolled intersection. Some states have additional requirements that forbid parking within 30 feet of any flashing beacon, stop sign or traffic control signal located at the side of the road.